Boho wedding accessories & decor, jewelry & clothing. Note from shop owner Thanks for stopping by! I'm in the process of relocating my life so my shop is currently on vacation. Wedding wreath head piece for bride or bridesmaid, Boho chic, Vintage style romantic. Wedding hair accessories. Bridal hair clip, Lace hair clip, Beaded hair clip , White flower hairclip, Alligator clip, Vintage Boho wedding hair clip. Long Boho neckalce, 18K Gold filled beaded feather pendant with Opal beads. Boho\tribal silver beaded earings in purple and turquoise. Gold plated Boho tribal feather dangle earrings with turquoise stone bead\red czech beads. Feather chandelier earrings, silver feather earrings, tribal earrings, statement earrings, Boho jewelry, hippie jewelry. Flower hair comb, pink Flower hair comb, decorative comb, Rustic wedding, Boho wedding accessory, Country wedding. Floral hair comb, Back headpiece, Amaranth Flower headpiece, half wreath , Boho wedding accessory, Country wedding. 100 Birthday event. Me and my sister with my grandmother in the middle. Me at my working table. Sweet Chantel and her husband. I was a kindergarten teacher for several years while studying Interior Architecture and Design. Being a teacher and a student was a great challenge for me since I was also diagnosed with Fibromyalgia and Hashimoto disease. I found myself struggling to cope with the work that had to be done and eventually quit my day job. I kept going to university and even graduated with top grades, but my inner compass was telling me that I was on the wrong path. My Nana, with whom I grew up, passed away. A couple of weeks before her passing she gave me a gift of words. She said that I must live my life to the fullest and go out there and experience things. Those words later became a part of my interior voice which led me to reach for my childhood dream: becoming an artist and making a living out of it. I chose to name my shop in memory and tribute to my Nana Belle (Bella Rivka) and hope she is watching proudly. 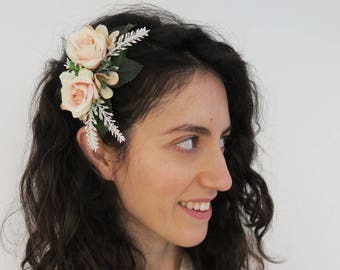 I make wedding hair accessories and decorations with wire, lace, satin, fabric flowers and beads. I also make jewelry and up-cycled hand drawn clothing. The clothes are bought from a local Vizo (Social organization) shop which gives all its profit to women and children in need. This way I give back to society plus it is ecological. I draw inspiration for my wedding collection from Edwardian Bohemian era. I find these times fascinating with beauty. My jewelry is mainly inspired by world wide tribes (with my own interpretation) and my clothing are a mix of tribal, ethnic-folk-gypsy inspired. All of the above inspires me and I add my own splash of fantasy that creates Nana's Bells. I put a lot of love and devotion into my creations and my shop and the thing that makes me the happiest is to know that somewhere out there, there is a satisfied lady enjoying what I made.